One of the coolest parts of being a thesis adviser is watching the ingenuity and thoughtfulness around a really cool project, and a sharp student. 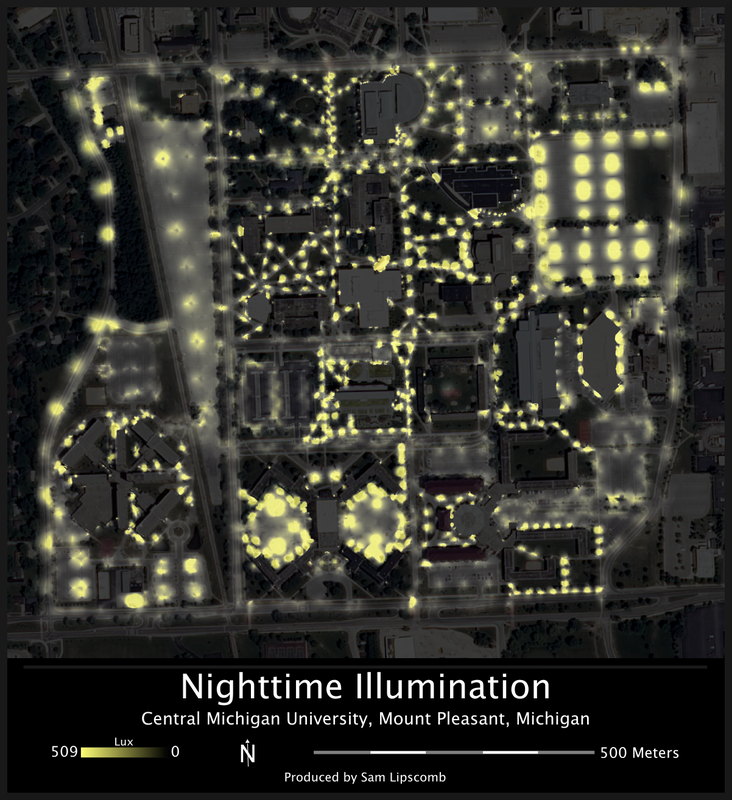 Central Michigan University geography student Sam Lipscomb has been building an analysis model of perceived personal safety that considers terrain, obstructions, lighting, and emergency call boxes to provide pictures of blind-spot risk across a campus. Thoughtful, practical, and important. How can we accommodate our visitors while doing our best to ensure their safety? Where should we put lights for best effect?Where do we currently have troublesome areas? Where should we position Blue Lights (emergency call boxes with blue lights sprinkled around campus)? Where should security patrols be located? These questions are inherently geographic. But to some degree the notion of place is considered only inadvertently (and less desirably) as a pull-through of where utilities, easements, and landscaping are already conveniently situated. That, and well-meaning hunches. This path-dependent mode of planning can really miss out on some key insights made possible by intentional spatial thinking. Parking lots pose a substantial blind-spot risk. Though generally well-lit, a crowded parking lot dramatically reduces a person's overall eye-level visibility. 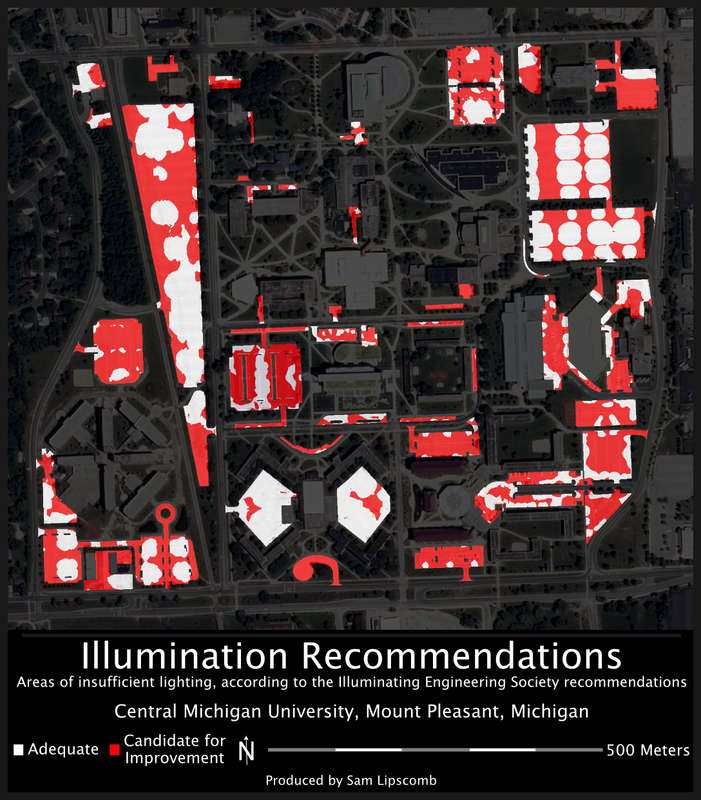 A campus-wide analysis of visibility, incorporating a local line-of sight rating for every pixel. 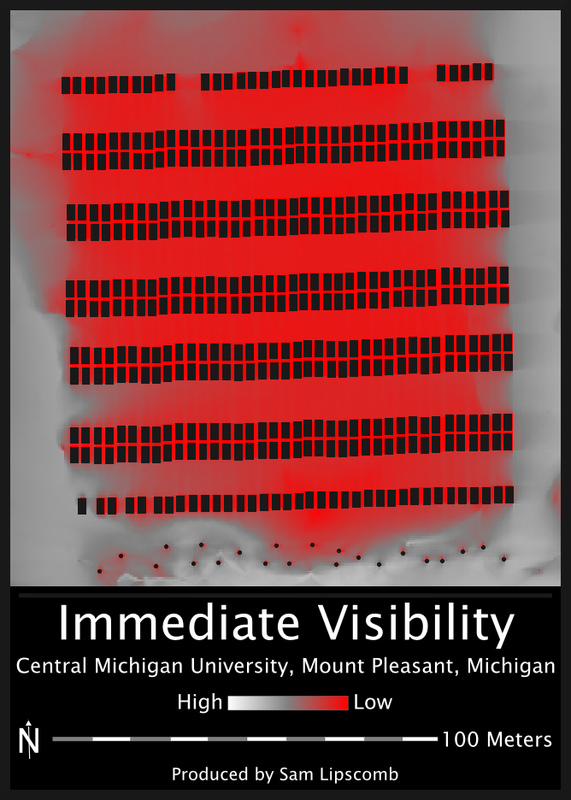 Brighter areas are more open while red areas mark potential blind spots. A general viewshed of the constellation of emergency call boxes (blue lights with emergency two-way communications). Red areas can see no call boxes. White areas can see at least one. Here is that emergency call box visibility layer weighted by how accessible a call box is, given distance, terrain, and obstructions. Black areas can't see any call boxes; red areas can see a call box but it's less accessible (or nearby but blocked from view). White areas show where call boxes are readily accessible. Here, Sam has defined areas that are candidates for enbrightening. Here's the recommendation for parking lots. 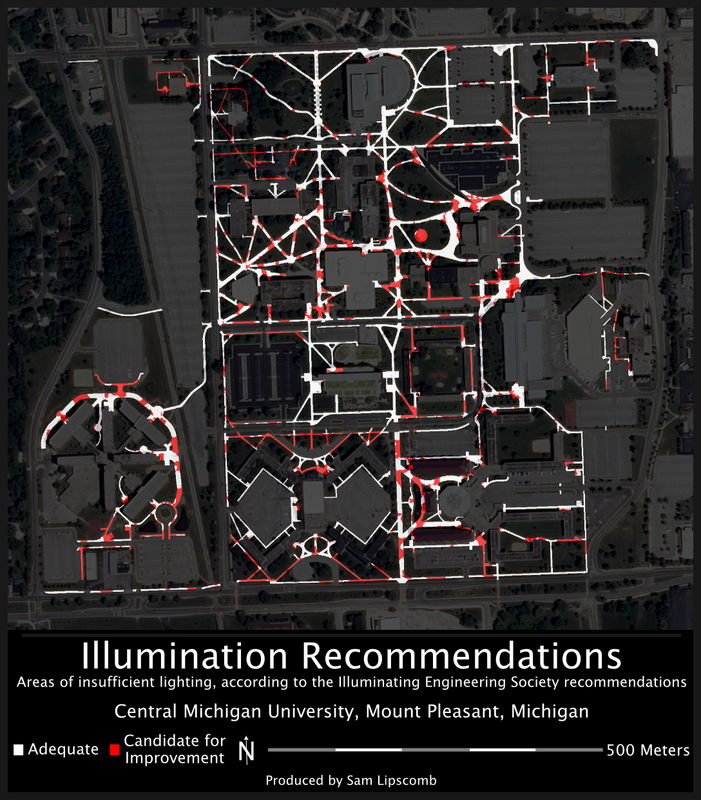 And recommendations for enhanced lighting of pedestrian areas. Applying spatial brains and tools provides a quantifiable component to an informed and proactive design strategy for the arrangement of things that impact a person’s safety. Like lighting, emergency call boxes, fences, sidewalks, plantings, signage, patrols, safety education –pretty much everything. Sam's doing thoughtful and useful work and I anticipate its eager adoption. Find a recent draft of Sam's research here.